Rep. Antonio Guerrera, who co-chairs the Transportation Committee, speaks during Monday’s press conference on tolls. Photo by Christine Stuart. 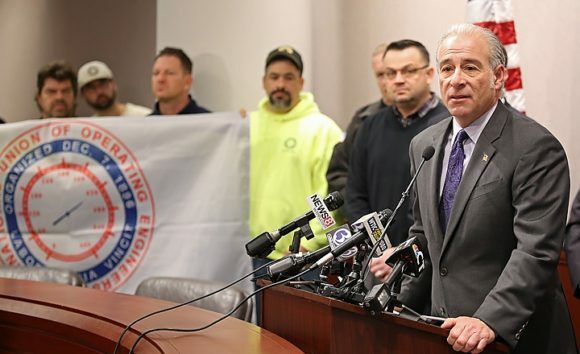 Read the full story, which includes a quote by local State Rep. Devin Carney (R-23rd) and was published on CTNewsJunkie.com, Jan. 29. at this link. 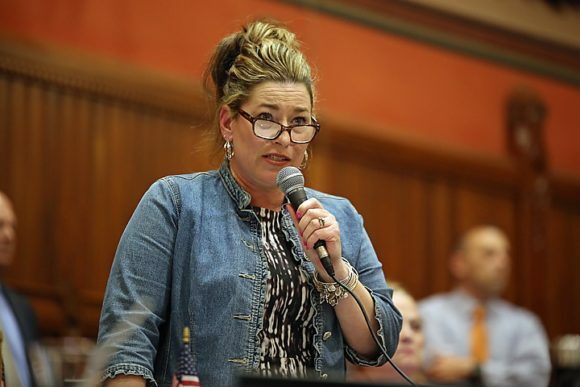 HARTFORD — Democratic legislative leaders in the House weren’t going to wait for the start of the legislative session to debate electronic tolls. They want to hold a vote and pass it as soon as possible. Editor’s Note: CTNewsJunkie.com and LymeLine.com are both proud members of the Local Independent Online News (LION) publishers group. We are glad to offer links to each other’s articles. Former President Bill Clinton told a friendly crowd of party loyalists Tuesday that Democratic Gov. Dannel P. Malloy should be elected by 10 points or more based on what he’s been able to accomplish. Read the full story by Christine Stuart and published on CTNewsJunkie.com Sept. 2, at this link. LymeLine.com is a proud member of the Independent Media Network LLC, along with CTNewsJunkie.com. File photo by Melissa Bailey, published in CTNewsJunkie.com. Attorney Irv Pinsky has filed a $100 million claim against the state on behalf of his six-year-old client who was in the Sandy Hook Elementary School when gunman Adam Lanza entered the school on Dec. 14 and killed 20 kindergarten students and six teachers before turning the gun on himself. Read the full story written by Christine Stuart and published Dec. 28 in one of our partner online newspapers, www.CTNewsJunkie.com, at this link.